In its ongoing effort to squeeze out carbon pollution from the U.S. economy, the Obama administration’s latest target is the trucking industry. On June 19, the EPA proposed new limits on greenhouse gases from heavy-duty trucks. According to the EPA, the new regulations would slash 1 billion metric tons of greenhouse gases. Heavy-duty trucks manufactured from 2021 to 2027 will have to become 24 percent more fuel efficient, a requirement the EPA says will create new jobs, reduce the cost of freight, and clean up the air. Tractor trailers for 18-wheelers will also have to meet fuel standards for the first time. There is a lot of low-hanging environmental fruit to pick by imposing fuel standards on the trucking industry. Each year, an estimated $10 trillion worth of goods are moved by trucks across the country. However, the fleet only gets around 6 miles per gallon, meaning a massive amount of fuel is burned. Heavy-duty trucks consumed around 2.7 million barrels of oil per day in 2013. Even increasing the fuel efficiency in trucks by a little bit would go a long way. Despite only accounting for about 5 percent of the vehicles on the road, heavy-duty trucks are responsible for about 20 percent of the country’s total greenhouse gases in the transportation sector. And those technologies are becoming increasingly affordable and accessible, and the EPA rules may merely accelerate a trend that is already underway. The technology to achieve fuel savings already exists, and the industry even has a few options on how to get there. Garbage trucks, bus fleets, and tractor trailers are increasingly turning towards compressed natural gas (CNG) or hybrid technologies. CNG trucks, for example, can slash emissions by one quarter, while hybrid-electric can cut emissions by nearly half. Waste Management, a garbage hauling company, is moving the quickest on CNG trucks. It has more than 3,000 natural gas trucks, and is moving forward plans on using natural gas in 90 percent of its new trucks. Waste Management estimates that by 2020 it will save over $1 billion per year in fuel costs by slashing 350 million gallons of fuel. The EPA is staring down a lot of heat from utilities over its rules on power plants, but it is finding itself a willing partner with the latest fuel economy standards for heavy-duty trucks. So What Exactly Have Fossil Fuels Done For Us? 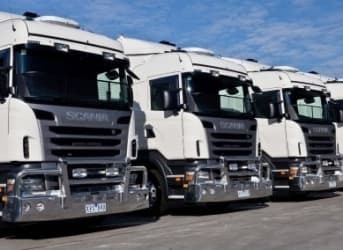 The big truck makers will increase revenue massively as the get to boost truck prices to cover the new technology to make them more efficient AND by gaining market share from small truck makers who have failed to invest in R&D and can quickly capitalize on the market demand for efficiency. Workers will also gain as the labor costs increase - ie, workers get paid more. While truckers will pay higher prices for trucks, they can both pass on higher costs as well as benefit in the long run from lower fuel prices. Given the long distances backed into the economy, it will require a lot of investment to avoid paying more workers making more efficient trucks. Unless shippers switch to railroads, but that would require railroads invest in more multimodal terminals and more double tracking to speed container shipping by rail to beat trucking. Investment is costly because it requires paying workers. In every case, the rule creates jobs that will put more money in the pockets of workers who will spend that increased money buying more stuff shipped by truck and rail.